Squelch ($0.37) Price History from major stores - Champions of Kamigawa - MTGPrice.com Values for Ebay, Amazon and hobby stores! Card Text: Counter target activated ability. (Mana abilities can't be targeted.) Draw a card. 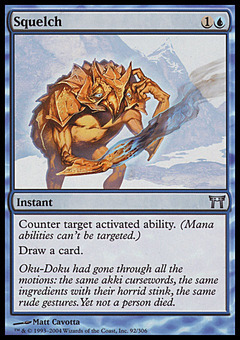 Flavor Text: Oku-Doku had gone through all the motions: the same akki cursewords, the same ingredients with their horrid stink, the same rude gestures. Yet not a person died.